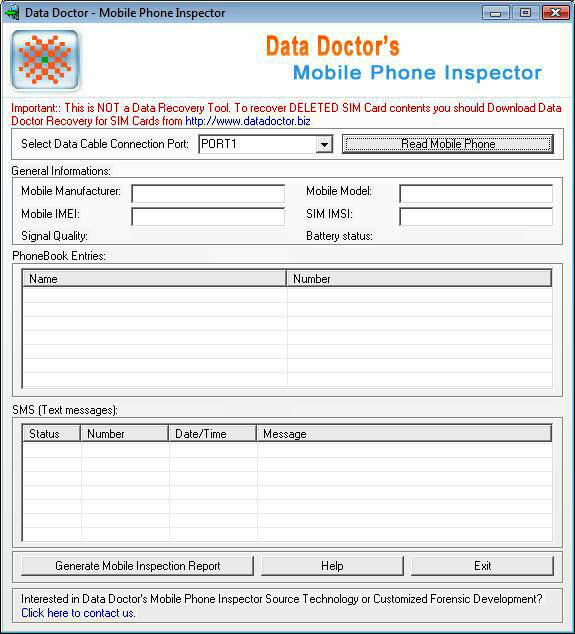 Cell phone inspector utility is available with VC++ source code that displays all general information about your cell phone SIM card such as SMS, memory status, Sim IMSI number, mobile IMEI number, model number, phonebook number, service provider name and service dialing numbers in few minutes. Mobile forensic software supports Pocket PC mobile phones, Smart phones, Windows compatible multimedia mobile phones, WM5, WM6 based PDA cell phones etc. Qweas is providing links to Mobile Forensic Software 2.0.1.5 as a courtesy, and makes no representations regarding Mobile Forensic Software or any other applications or any information related thereto. Any questions, complaints or claims regarding this application Mobile Forensic Software 2.0.1.5 must be directed to the appropriate software vendor. You may click the publisher link of Mobile Forensic Software on the top of this page to get more details about the vendor.